Let me paint you a picture. Last weekend, we were heading to a birthday party for my great uncle. We weren't supposed to leave until 5, so I felt like I had plenty of time to get ready and spent a good chunk of the day lazying around in my pajamas. Then all of the sudden it was 4, my mom texted me to say we actually needed to leave at 4:30, and the outfit I had picked out did not work, and the hair style I had tested out the day before was refusing to recreate itself. We rushed outside to take pictures before leaving, and only one, the very first picture we took, turned out. Oh, it was a day of the #struggs. It was also so windy that this hairdo ended up looking crazy afterwards and I just took it down and went with it. But then Jeff made me giggle on the drive up and my sister and her husband wore silly matching sweaters and I made (maybe too good of) friends with the bartender, so it ended up being a pretty good night in the end. So here you have it, the one picture of my outfit from Saturday's party. Casual, cute, with just a hint of festivity. Tell me, do you have the struggs every time you try to get ready for a party? Despite the hurry you look amazing and I love your hair! If you had to get one picture this sure is a cute one! You look lovely, I just love the color of your skirt. Love the little nod to classic red + green. And I HATE IT when I laze about too much and then all of the sudden am rushed to get ready. I do this all the tiiiiiime, haha. I felt the same way on Thanksgiving, all the sudden I was rushing around the house trying to find something to wear! 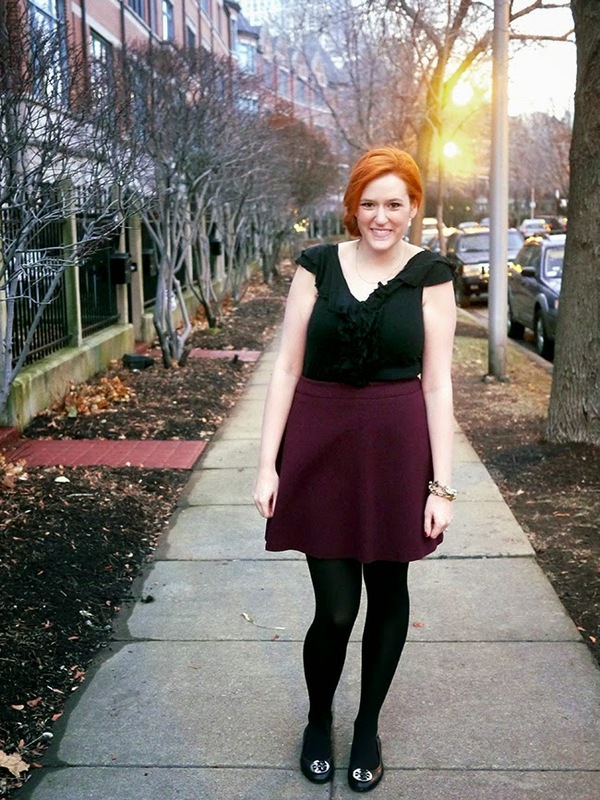 Such a fun holiday outfit with the perfect amount of "festive-ness"! oh, the struggle. I'm meeting up with long no seen friend and I can't think of nothing what to wear. You look gorgeous. I love the color pairing and how you styled this look. oh yes EVERY time! I can never get ready smoothly for anything haha. Glad you had a good time! You look darling in this outfit, Kristina! I'm not good at getting dressed for parties (or anything other than weekends/work, really...), but this is so cute! I love how your hair looks here - very romantic! you look great! such a pretty outfit!